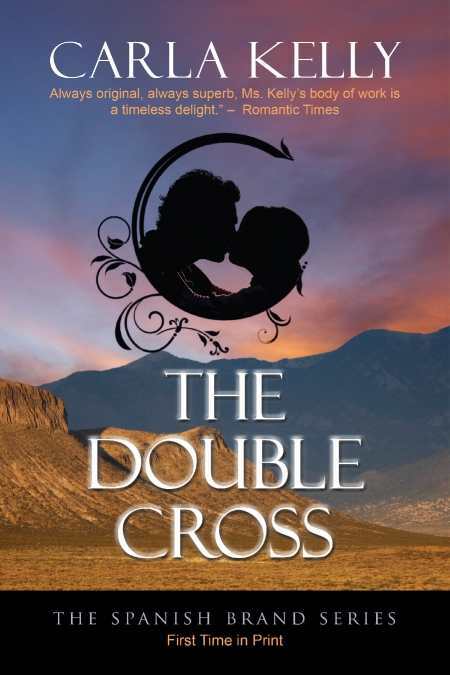 The first in Carla Kelly’s new Spanish Brand series, The Double Cross is a late-­eighteenth-­century story set in the Comancheria region of the American frontier that encompasses a large part of both Texas and New Mexico. Don Marco Mondragon, a widower and juez de campo (rancher and brand inspector), is about to meet his unlikely future bride in the form of Paloma Vega, a downtrodden but spunky young woman working as an unpaid servant in her uncle’s home. Marco and Paloma are brought together by, of all things, a small yellow dog that has brought a bit of sunlight to Paloma’s dreary life, a dog which Marco purchases from her with the excuse of needing something to warm his feet. Thankful for the money, Paloma agrees to part with the dog but is nonetheless saddened by the loss of her only comfort. A local priest with good intentions schemes to unite man, woman, and dog but is met with obstacles along the way. The reader eventually discovers that “The Double Cross” does not refer to a plan gone wrong but, rather, is the nickname of Don Marco’s own cattle brand. Kelly skillfully invites readers to share in this romantic adventure that is played out amidst scenes depicting the harsh landscapes and living conditions on the frontier—all punctuated with an assortment of unsavory characters pitted against the heroic.